In this page, Rockland Window Coverings – with a conveniently located showroom in Spring Valley, New York (NY) – is here to help you see how Hunter Douglas’s PowerView® Motorization transforms homes. Contact us today to learn more about this revolutionary operating system and the other Hunter Douglas products we carry. Hunter Douglas’ latest innovation is here to make your home more convenient, safer, and more exciting. That innovation is the PowerView® Motorization operating system. Experience your home like never before with motorized window treatments that respond to your command, move on your schedule, and even follow the pattern of the sun. PowerView® Motorization can be controlled in a variety of ways, so you can find the one that works for your home. This operating system is especially perfect for hard-to-reach windows and skylights, because you no longer have to operate them manually. Forget everything you know about remote controls. The Pebble® Remote is surprisingly sleek and easy to use. You can control up to six groupings of motorized window treatments, either separately or at one time, with the Pebble®. The Pebble® Scene Controller allows you to trigger your own programmed settings to take place and is available in either the form of a remote or device affixed to your wall. It is also available in 10 stylish colors, so you can choose the one that works with your existing décor. Unleash everything PowerView® Motorization can do with the PowerView® app. You can precisely control your motorized window treatments just like you can with Pebble®, only with no limitations. Create and save custom settings for different occasions in each room and watch them take place with just one touch. There is also a function that allows you to schedule settings to take place during the day at just the right moments, allowing you to go about your day, sit back and relax, and watch as your blinds, shades, or shutters move on your time. Integrate the PowerView® app with Google Assistant and Amazon Alexa to control your window treatments with only your voice. PowerView® Motorization not only creates a convenient way for you to operate your window treatments, it makes your home safer for small children and pet. PowerView® Motorization does away with cords, removing a potential hazard. The wiring system is completely contained, and there are no exposed electronic components, which keeps your window treatments safe and sleek. 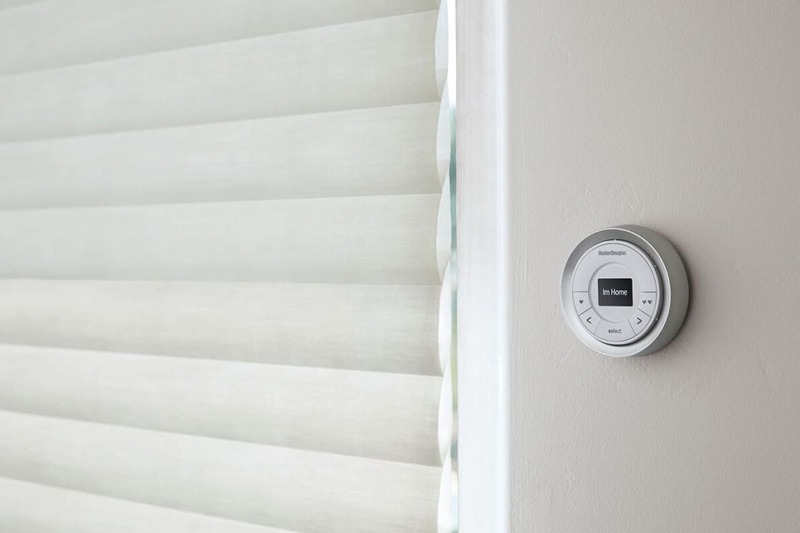 Plus, the Remote Connect feature allows you to control your motorized window treatments from anywhere in the world. At Rockland Window Coverings we are proud to offer the industry leading window treatments, which is why we offer products from Hunter Douglas. We are located in Spring Valley, NY and serve the surrounding area, including Pomona, NY and Saddle River, NJ. Stop by our showroom to see how PowerView® Motorization transforms homes. Designed By MimiDesign in conjuntion with www.templatesquare.com .